Malaysia has one of the most conducive environments for digital marketing. Most areas are urbanized and the citizens are well-educated, showing a total literacy rate of 95%. The country’s modern attitude also reflects on its rapidly growing online population. 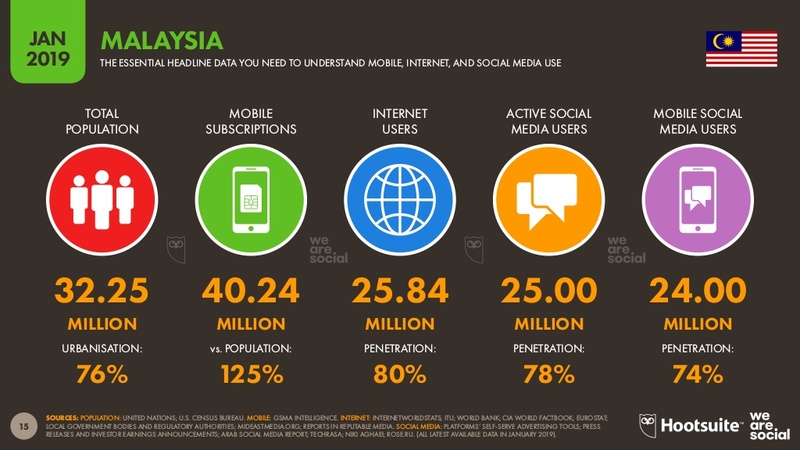 According to We Are Social’s annual digital ecosystem report, four-fifths of Malaysia’s 32.25 million population are now online, where 78% are active social media users. This makes the country rank 27th globally with a 79% Internet penetration rate, one of the highest in the Southeast Asia region. On average, each resident handles four social media accounts, leading Malaysia to experience a significant increase in spending time and money online. The country’s average time spent on the internet every day is about 8 hours and 5 minutes, in which 2 hours and 58 minutes are used on social media. Due to this, the country has an 83% frequency on internet access per day. In terms of online spending, Malaysia is also viewed to be extremely comfortable with taking up online purchases and with the general digital turn of society. Currently, it has one of the highest level of mobile online shopping penetration among ASEAN countries with a 58% penetration rate. It is also important to note that 96% percent of adult Malaysians use mobile phones, followed by 88% usage of smartphones. 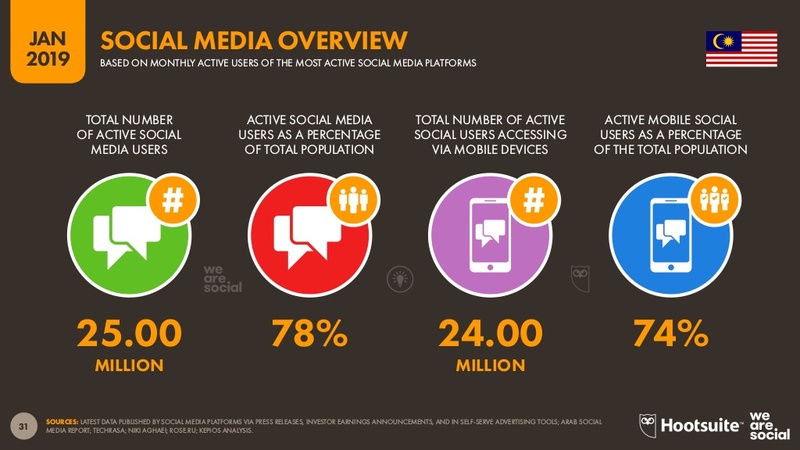 In addition, mobile phones are used significantly more to visit social media sites compared to computers. This has allowed the country to emerge as the fourth with the highest mobile social media penetration globally, and the first in Southeast Asia. Therefore, marketers must ensure that mobile-friendly strategies are developed. Despite the great advance of the retail e-commerce sector in the country, digital marketing is still relatively new in Malaysia, resulting in a reluctance of Malaysian marketers to invest in the field. In GetCraft’s survey of 50 marketers across different industries in the country, two out of five admitted that this hesitation stems from being unsure of the implications of digital marketing and on the usage of digital strategies. However, the country is gradually realizing the significance of digital marketing. If this gap is finally bridged, it could gain the whole country a full high-income status, creating even more opportunities and attracting more business appetites. As of January 2019, YouTube has become the leading active social media platform in Malaysia. This has become so, because Malaysians have since gravitated toward the app for browsing video content instead of the usual television. 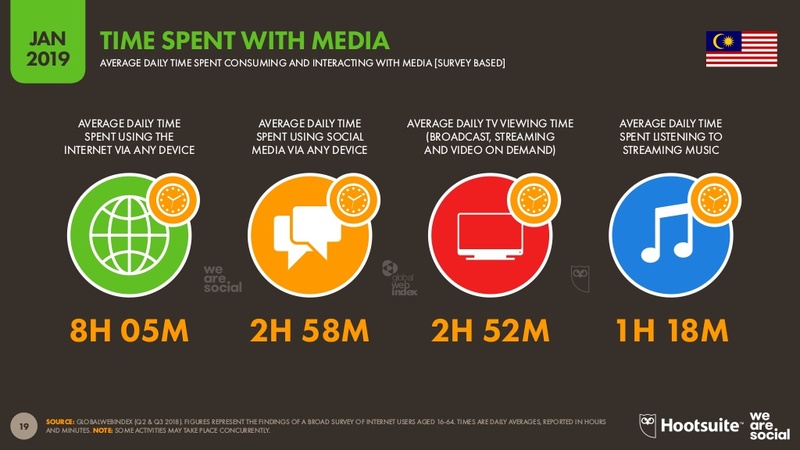 Ninety-five percent of Mobile activity come from watching videos on mobile. 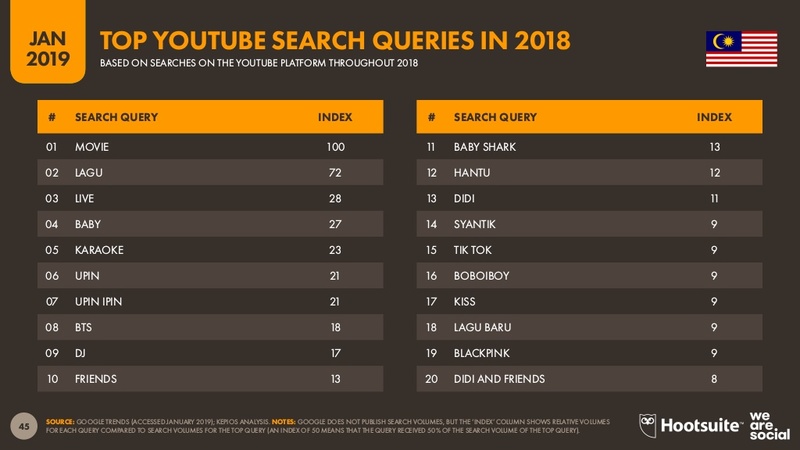 The top YouTube search queries in 2018 are Movie, Lagu and Live. Facebook is undoubtedly one of the leading social media platforms in the whole world. In between 2018 to 2019, it saw a 9.6% increase in monthly active users on a global scale. This global reach still rings true among Malaysians and has garnered a whopping 91% rate, taking its place as the second active social media platform in the entire country along with WhatsApp. 24 million users in Malaysia can be reached with advertisements on Facebook. 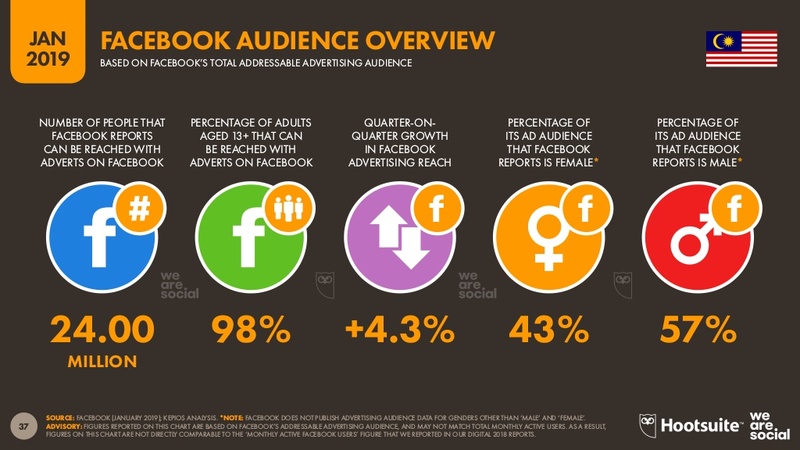 98% of the Malaysian Facebook users are adults aged 13 and above can be reached by advertisements on Facebook. 43% of those users are female and 57% are male. 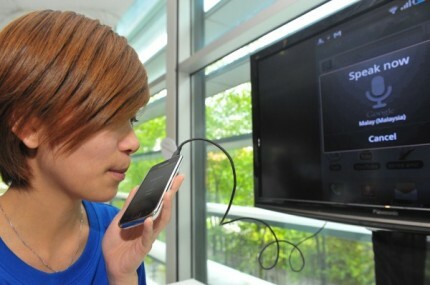 The chat app trend among Asian countries is not lost in Malaysia. WhatsApp makes its way as the number one messaging app among Malaysians and ranks second along with Facebook as the most active social media platform in the entire country. As of January 2018, the app has accumulated a 68% penetration rate with approximately 21 million users. 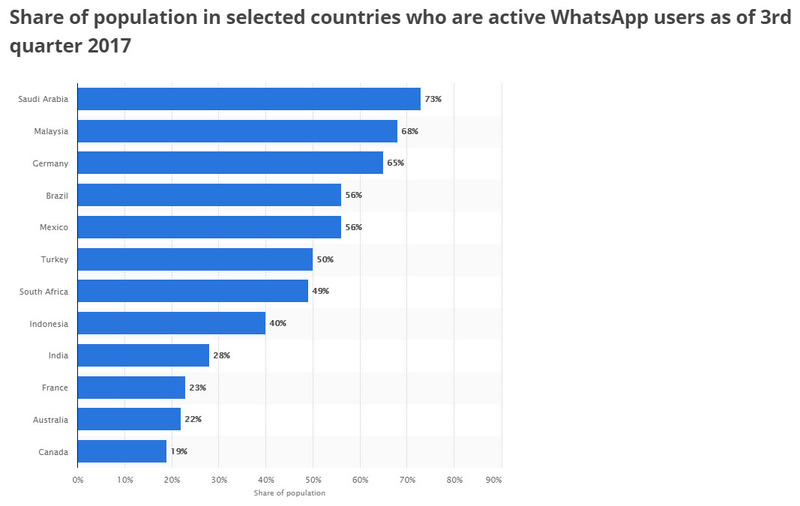 Following far behind in the chat app category are FB Messenger, Skype, and Line, with penetration rates of 47%, 40%, 23%, and 19% respectively. 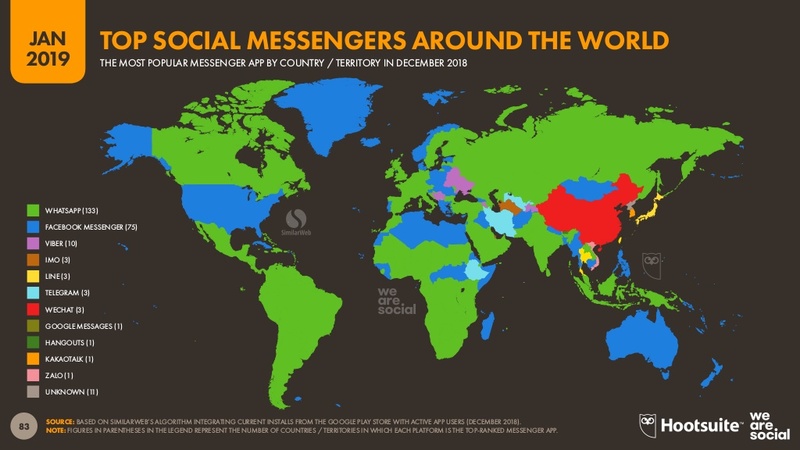 As of January 2019, WhatsApp takes the spot as the most popular messaging app worldwide followed by Facebook Messenger and Viber. 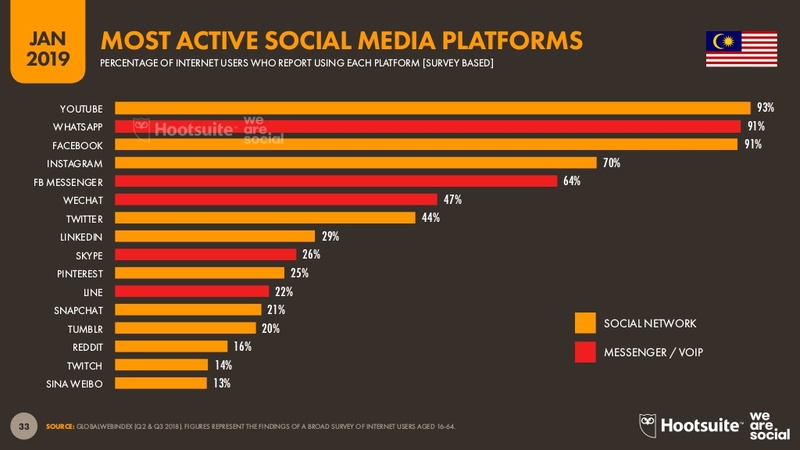 Instagram lands as the 3rd most used social media channel in Malaysia. 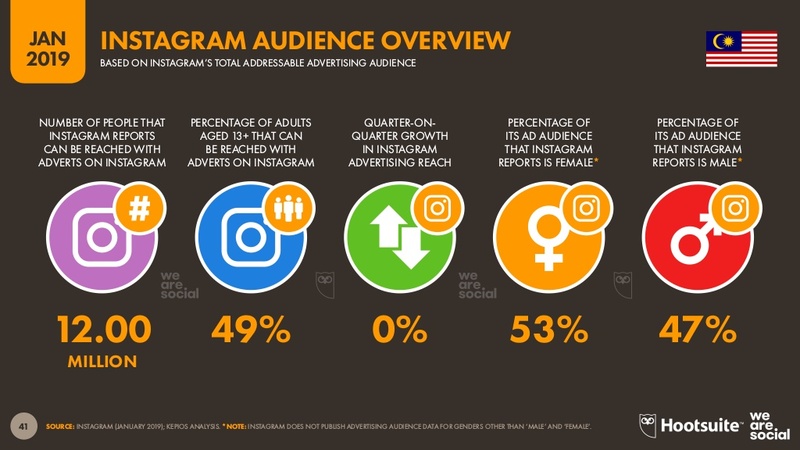 There are 12 million users in Malaysia that can be reached with advertisements on Instagram. Forty-nine percent of those are adults aged thirteen and above. Fifty-three percent of the users are female while Forty-seven percent are male. 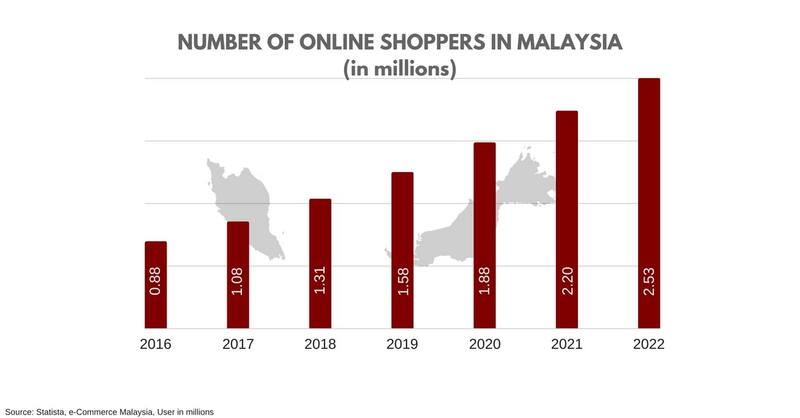 Digital marketers should look into the online purchasing behaviors of Malaysians, as the country holds a penetration rate of 67% for online shopping or an estimated 15.3 million online shoppers. This is one of the key factors behind its thriving retail e-commerce market, allowing the country to stand just behind Singapore. Improving and expanding the availability of e-commerce goods and services should also be the focus of digital marketers. According to Sue-Anne Lim, Dentsu Aegis Malaysia chief data officer, this will be an important facet towards more effective marketing strategies, especially for Gen Z and future generations who will soon view this as a necessity and not a mere want. 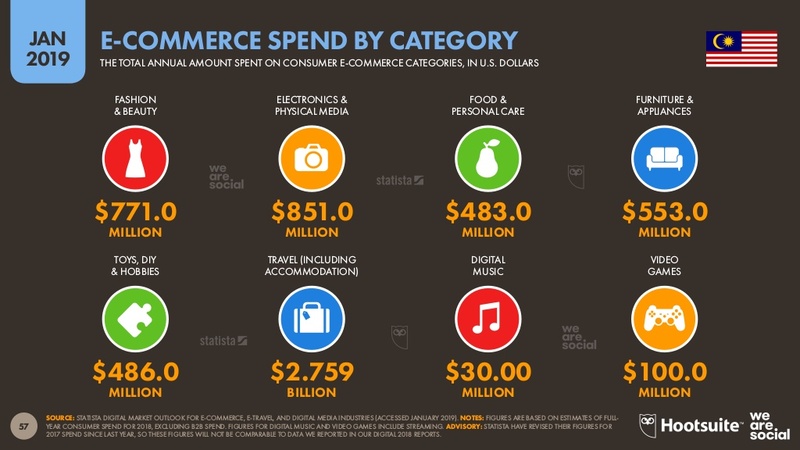 As of 2019, the top three most purchased categories of products are fashion and beauty, electronics and physical media, and food and personal care. Furthermore, recent data from Statista shows that revenue for the furniture and appliances segment has amassed US$688 million. At this pace, it is expected to exhibit a 9.8% annual growth rate, and by 2023, accumulate a market volume of US$998 million. According to GetCraft’s Malaysia Digital & Content Marketing Report 2018 survey, content marketing is the most exciting digital opportunity for all marketers, due to an estimated third of total media budgets in Malaysia going to digital advertising. This means that social media would be a highly important platform to maximize this opportunity. In line with this, digital marketing strategies should revolve around brand awareness. Currently, 83% of Malaysians connect to the Internet every single day. This means that as connectivity in Malaysia steadily expands, so will the opportunity for consumers to browse digital content. Since mobile phones are the new norm in Malaysia, mobile marketing strategies should not be the focus this year. This is apparent in how the country is shifting towards a more AI-centered approach to marketing. Sue-Anne Lim states that the mobile experience in Malaysia should have now reached 1st class, adding that applying AI will make consumer assistance so much easier because will be able to discern consumer intentions quicker and more efficient. There are 61% of Malaysians that believe new technologies offer more opportunities than risks, and 60% prefer to complete tasks digitally whenever possible. 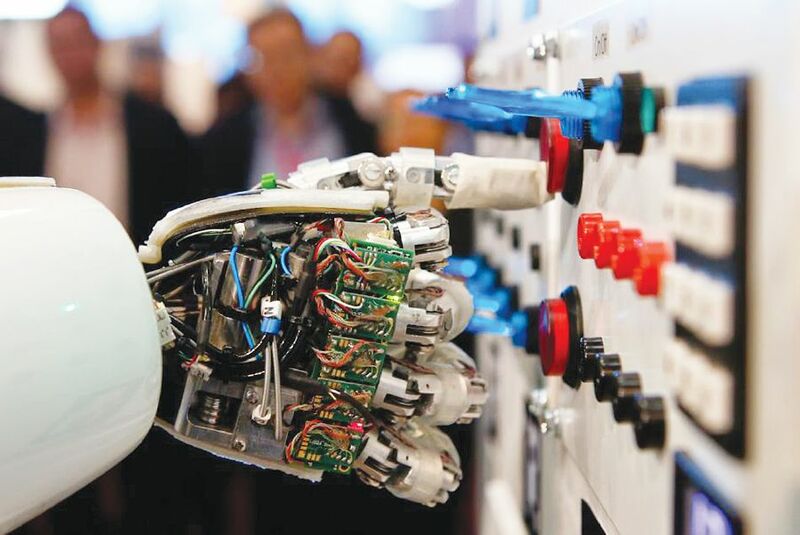 In line with these statistics, delving into the world of AI will be a smart move for marketing companies into further penetrating the country’s digital market. Marketers must learn to weave and implement the latest technological advancements into their marketing strategies. For instance, using voice search may give advertisements the boost that they need to open more opportunities today until the next few years. Adapting to this trend as soon as possible could mean engaging new consumers as well as existing ones. With the boom of e-commerce in Southeast Asia comes the demand for digital marketers. Now, every company wants one in their team. However, a problem has risen among those new to the field in Malaysia. As mentioned earlier, two out of five marketers are unclear on digital strategies, resulting in employers to look towards the junior end of the market to manage their digital marketing strategy. The assumption is that hiring a highly-paid digital marketer is not essential. Aside from these, there are inconsistencies in terms of recruitment of digital marketers. Recruitment fairs, online branding, and even traditional advertising methods are still used many digital companies to pick out candidates. The demand for digital marketers has also caused more residents, especially those in their 30’s or 40’s, to gravitate towards the digital marketing sector for a change of career. Most of the candidates have mixed skills and backgrounds, different from what the job requires. When this happens, the demand for people with the necessary skillsets substantially increase, leading some companies to solve this by merging the positions of their current marketing staff with that of more digital roles. According to Tom Osborne, Regional Director of Hays Malaysia, the most ideal candidates are those who not only appreciate the field, but are driven to use these to create bottom-line value. It may take time for Malaysia to fully absorb the significance of digital marketing, but when it does, it will become one of the country’s most profitable investments. Last year, one of the best digital campaigns in Malaysia resulted from digital marketers quickly adapting to new technological trends and features and integrating them to their digital marketing strategy. 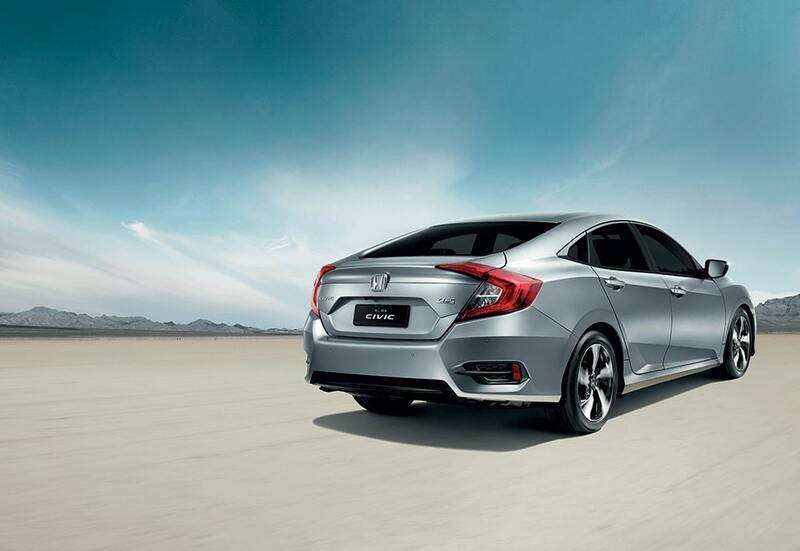 For the case of Honda Malaysia, the success was due to their quick implementation of the Facebook Live feature into their #RideTheDream digital marketing campaign for the brand-new Honda Civic. A series of microvideos were released showing bite-sized contents of the model’s new and improved features, successfully increasing fans’ anticipation of the big reveal. 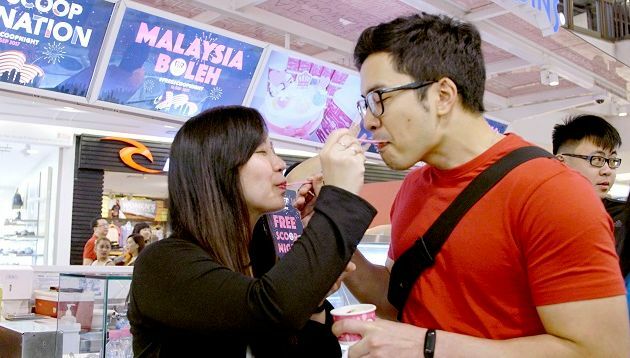 During the 2017 SEA games, the ice-cream brand Baskin-Robbins partnered with creative and digital agency FOREFRONT International to launch their #freescoopnight campaign. The reception on social media was huge, gaining the company 6,892 fans and 87.85% increase in engagement within the campaign period. It also received the same success on Instagram, where an accumulated 641 posts using the campaign hashtag were posted by consumers. The campaign also garnered the award for Best-Idea Integrated Media at MARKies Malaysia in 2018. The online marketing industry is a promising one in Malaysia. Although this field is fairly new in the country, its residents prove that they are both eager for the constant technological changes that come along this digital age, as well as quick to apply them in their daily lives. Digital marketers must, therefore, focus on developing strategies that are both advanced and consumer-centric to ensure their share in the online marketing industry. Contact us at Info Cubic Japan today to learn more about online marketing in Malaysia.